Withdrawing a registration removes its contents from OSF. Withdrawn registrations will maintain basic metadata (e.g. title, contributors, DOI, etc.) about the registration, as well as a justification for its withdrawal, but the registration form, files, and other content will be removed. Please note that registration withdrawal is irreversible. Open the registration that you want to withdraw, then click the Settings tab in the navigation bar. The "Settings" page will appear. Click the red Withdraw Registration button. You will be taken to the "Withdraw Registration" page. On this page, provide a justification that indicates the reason for withdrawal. Then, type the confirmation word into the second field. You will receive an email in which you can either approve or cancel the withdrawal of your registration. All administrators on the registration need to approve in order for the registration to be withdrawn. If no action is taken within 48 hours, then the registration will be withdrawn automatically. 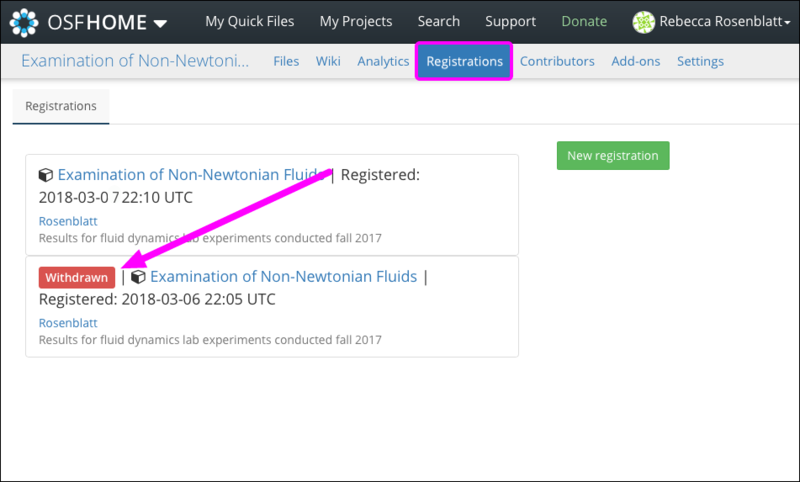 The "Registration Overview" page will have a banner at the top of the page indicating that the registration is withdrawn. 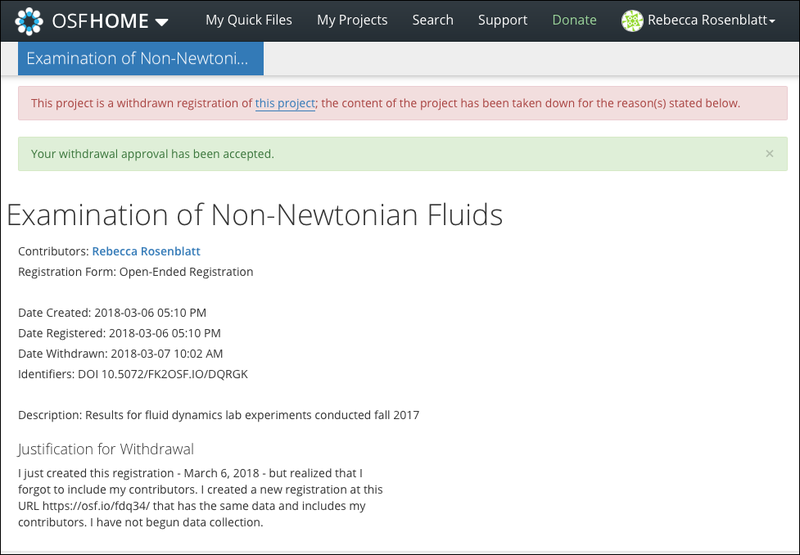 The "Registration Overview" page will also maintain basic information, such as its title, contributors, date created, date registered, date withdrawn, DOI, description, and the justification for its withdrawal. 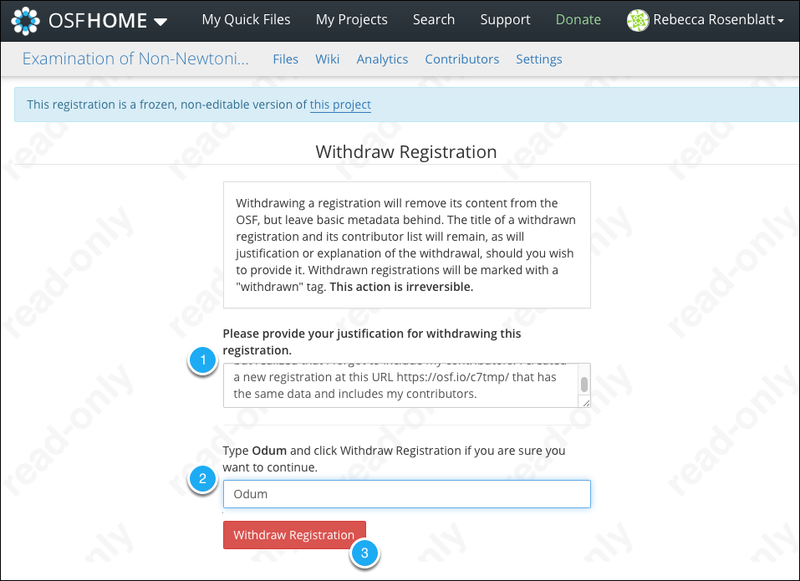 On the original project's "Registrations" page, the registration will be marked with a "Withdrawn" label.